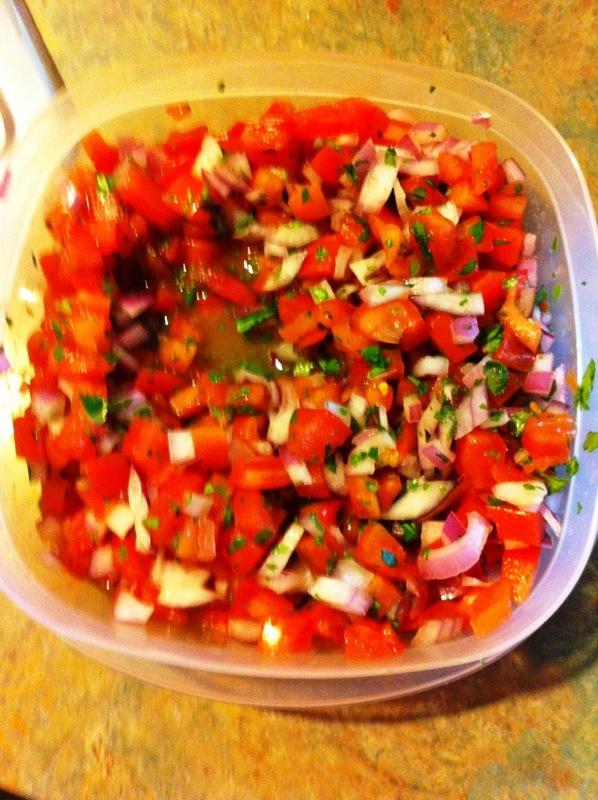 I spent a good portion of the morning trying to make pico de gallo again. My last attempt was not bad, maybe a little too citrus. This time I added more tomato and cilantro in an attempt to moderate the sourness of the lime juice. At the very least, it’s very nice and colorful. It should cheer up any plate, even if I usually wind up putting it in a burrito. It brought back to me that cooking should be fun. For me, one of my biggest beefs with my job is never really seeing the finished product. When you cook, you see that and it’s much easier to take pride in getting a perfectly diced tomato or onion. Getting beautiful diamond-shaped grill marks when you grill a steak or a piece of chicken. I’ve said before that cooking is not just about taste. It’s smell and appearance and texture, heck, even the sound if you’re eating fajitas. I also cannot stress the importance of having quality cutlery in your kitchen. You can get by with substandard cookware, but poor quality knives make cooking much more of a chore than a joy. I speak from experience… I was always the guy to buy the 54 knives for $20, figuring a knife was a knife. One day, not long after The Management and I sealed the deal, I was attempting to thinly slice dry rubbed pork tenderloin. The cheap knives were shredding it and I finally reached my wits end. I said that we needed to invest in at least a good carving knife. The Management (aka Supportive Partner Woman (Possessor of Good Ideas!)) suggested taking some of the Bed Bath and Beyond gift cards that we received as wedding gifts and going to find a carving knife. We came home with a beautiful Henckels carving set in a presentation box. What a revelation! It went through the meat like, well, a hot knife through butter. Paper thin slices? Not a problem! It was like I had died and gone to paradise. I started thinking about upgrading other knives, checking eBay regularly, thinking that I should keep in the same family. I studied up on knife manufacturing and what to look for (full tang, balanced, polypropylene riveted handles, etc.) and I also found out that you could test the knives at Williams-Sonoma. One night around the holidays, SPW and I visited our local Williams-Sonoma and were gazing longingly at the cutlery when we noticed a decent sale on a Wüsthof starter block set. Wound up with a 10″ chef’s knife, two paring knives (serrated and non), a boning knife, a 9″ bread knife, a 5″ Santoku and a 6″ slicing knife. To say I’m happy with these would be an understatement. I even bought a knife sharpener to keep them at optimum sharpness. We’ve since added a tomato knife, a panini knife and steak knives to the block. So, my cooking tip of the day is to spend the extra scratch and invest in good knives. Even if you don’t get a full block, a good chef’s knife will make all the difference. Whether you get Wüsthof, Henckels or even Shun, you won’t be disappointed. Also, for the good of the order, I find it amazing that 90% of German cutlery is made in Solingen. You are absolutely correct, Brian! One of the things I learned from my dad is that you must have very good quality knives and you must care for them properly. Poor quality and/or dull knives are useless and unsafe.